Create a warm, contemporary dining experience with the Acasia 5 Piece Dining Set from the Acasia Dining Collection by Condor Manufacturing. This beautiful set has a sleek, modern feel thanks to its two-tone look with a striking cherry finish on the top of the table and side chairs and a dark walnut finish everywhere else. Small details like geometric designs on the legs and the inclusion of knots in the table top and chair seats make this set special. 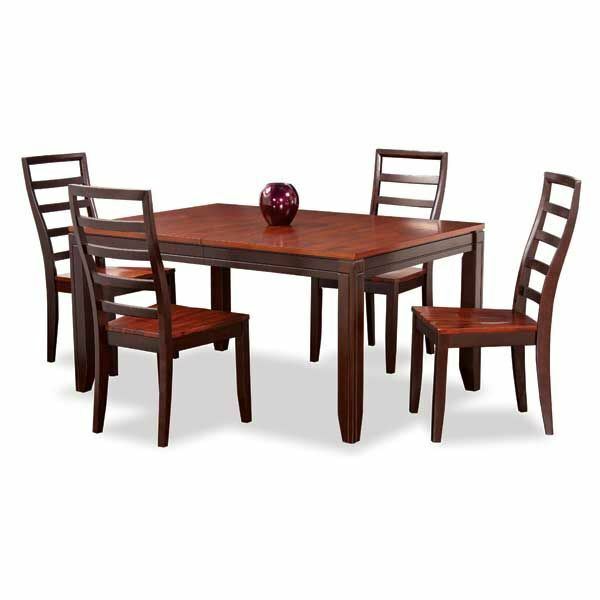 The table includes an 18" butterfly leaf extension to let you entertain in style by allowing up to 8 people to sit comfortably. Constructed of select veneer and hardwood solids. Table includes one 18" butterfly leaf and expands from 60" to 78". Leaf stores under the table when not in use. With the warm finishes and comfortable contemporary design, the subtle beauty of Acasia dining room collection features furniture that is sure to enhance the decor of any dining room. The relaxing two-tone brown finish flows perfectly over the subtle framed details and tapered legs to enhance the stylish contemporary design of this furniture collection. With the ease of the butterfly leaf and gentle curved design of the chairs, the Acasia dining room collection is the perfect fit for any comfortable dining experience.